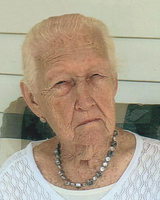 Provide comfort for the family of Gertrude Tubbs with a meaningful gesture of sympathy. Gertrude Frances Tubbs left this earth to be with her Heavenly Father on Thursday, January 24, 2019 surrounded by her children. She was born January 10, 1929 in Bourbon County, KY the daughter of the late John and Lucy Ball Highland. She was the beloved wife of James “Doddle” Tubbs of 59 years who preceded her in death in 2008. Also preceding her in death were her seven siblings. She was a retired seamstress, having worked at Hansley Mill for several years, and a member of Trinity First Church of God. Gertrude is survived by her six children, Janis Frances Reed, Steve (Alice) Tubbs, Charlotte (Ronnie) English, John (Cindy) Tubbs, Diana (Jimmy) Brewer, and David (Nancy) Tubbs as well as eleven grandchildren, several great grandchildren and one great great grandchild. The funeral service for Gertrude Frances Tubbs will be on Monday, January 28, 2019 at 1:00 p.m. at Hinton-Turner Funeral Home with Rev. William E. Singleton officiating. The interment will follow in Paris Cemetery with her six children serving as her casket bearers and her grandchildren as honorary bearers. Visitation will be on Sunday, January 27, 2019 between the hours of 5:00 p.m. and 8:00 p.m. at Hinton-Turner Funeral Home. In lieu of flowers, memorials are suggested to Bluegrass Hospice Care. To send flowers in memory of Gertrude Frances Tubbs, please visit our Heartfelt Sympathies Store. We encourage you to share your most beloved memories of Gertrude here, so that the family and other loved ones can always see it. You can upload cherished photographs, or share your favorite stories, and can even comment on those shared by others. Provide comfort for the family of Gertrude Frances Tubbs by sending flowers.